The Blue-fronted Parrotlet is an arboreal termitaria nester. This means it nests in termite mounds in trees. Male- underparts green/yellow; red lores and line below eye; dull blue forecrown and band from lores across upper cheeks to ear coverts; red bend of wing, lesser, outer median and inner primary coverts; red forewing; yellow underwing coverts; black central tail feathers with green toward bases; green/yellow lateral tail feathers tipped with black. Bill olive/yellow with grey at base. Eye ring bare and grey/white. Eye brown/yellow. Female- red on lesser and outer median wing coverts minimal or absent. 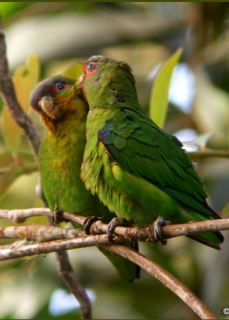 As in adult female, but with green forecrown with scattered blue feathers; red and blue facial markings absent. Eye grey. Calls in flight are soft and high-pitched notes repeated several times between pauses. Calls are louder when taking flight. Presumed to be declining locally from deforestation (particularly in Colombia). Cerro Jefe area, C Panama, to W Colombia, south on western slopes of Andes to El Oro, SW Ecuador, and N Colombia, at northern extremity of Cordillera Oriental, Norte de Santander-Cesar border, east to Trujillo, NW Venezuela. Found from 500-2000m (1640-6560 ft) in humid and wet forest, including tall secondary growth forest and cloud forest, mainly in upland country. Feeds on small seeds, fruits and blossoms. Recorded in Ecuador feeding on fruits of Clusia cf. alata. Gregarious; birds roost communally in forest canopy. Some seasonal and altitudinal movements, presumably in response to food availability. Usually seen in pairs or small groups of up to 15 individuals. Easily overlooked while quietly feeding in canopy.